Hard Case Crime, an imprint founded by Charles Ardai and Max Phillips in 2005, has been the gift to crime fiction fans that keeps on giving. With a mission to reprint pulp crime novels from the 1930s to 1960s while capturing the classic look and feel of the period, Ardai and company bring us a steady stream of gems from authors such as Erle Stanley Gardner, James M. Cain, and Lester Dent. After HCC was acquired by Titan Books, with its roots in comic book reprints and science fiction and horror novels, Ardai also began publishing new manuscripts by current authors. Stephen King (Joyland) and Lawrence Block (The Girl with the Deep Blue Eyes) are prominent examples, along with lesser-known authors such as Daniel Boyd, Jack Clark, and Allan Guthrie. Which brings us to Scott Von Doviak. An Austin, Texas-based film critic and television reviewer, Von Doviak has published three nonfiction works to date, including Hick Flicks: The Rise and Fall of Redneck Cinema. 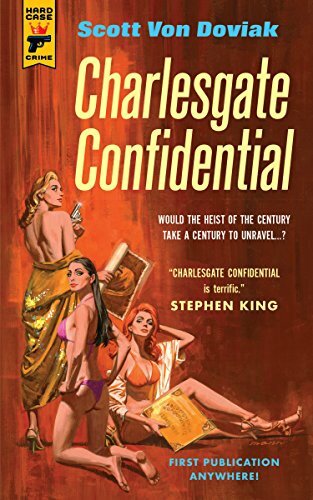 Charlesgate Confidential is his first novel. The primary strength of Charlesgate lies in its story. Following three timelines, one set in 1946, another set in 1986, and the third set in 2014, the novel tells the tale of a fabulous art heist that occurred in post-war Boston. The thieves were caught, but the stolen works of art were never found. Throughout, the Charlesgate Hotel, an actual structure that has seen life as a rooming house, college dormitory, and exclusive condominium building, remains a focal point of the tale. While the first timeline covers the museum theft, the second involves a college student who pokes into the history of the theft and the role his dorm building may have played in it. The third timeline then updates the mystery to the current decade, in which the former student returns for a reunion at a time when the Charlesgate has become a homicide crime scene. What happened to the works of art worth a fortune? Is Charlesgate really haunted, as some people claim? The problem with the novel is that it’s a chore to read. The characters are hopeless parodies of post-war Irish hoods, eighties college students, and modern-day homicide cops. The dialogue is so bad it sets your teeth on edge. It’s the sort of manuscript that, while being a good first effort, should have been sent back to the writer with firm instructions to enlist the help of a stern-minded coach and editor. “Emerson had been soundly defeated in all four games to start the season, never by fewer than twenty-five points. “‘They were pretty competitive in the first period on Wednesday,’ I said. Unfortunately, the entire novel reads like this. As a result, while Charlesgate Confidential may attract many fans of the noir subgenre with its clever storyline, Von Doviak will alienate and annoy many others with his unpalatable writing style. Readers not interested in bad parodies, intentional or otherwise, won’t make it all the way through this one.